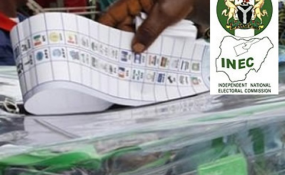 The Independent National Electoral Commission (INEC), yesterday, released the final list of 72 presidential candidates and thousands of National Assembly candidates fielded by various political parties ahead of the Feb. 16 contests. The final list released by INEC featured 144 names of presidential candidates and their running mates. However, the Social Democratic Party (SDP) does not have presidential candidate due to the court battle between ex- Governor Donald Duke and a former Minister of Information, Prof. Jerry Gana over the ticket. The ruling All Progressives Congress (APC) does not also have candidates for the national and state assembly elections in Imo and Zamfara states because of internal wrangling that took different factions of the party to courts. INEC Chairman Prof. Mahmood Yakubu said yesterday that the 2019 general elections would involve the highest number of registered voters and a record number of political parties. Prof. Yakubu who stated this during a meeting between the commission and Committee of Vice Chancellors (CVC), said while the final register of voters stood at 84,004,084 some 91 political parties had fielded candidates for different elections. He said 1,904 candidates would slug it out for 109 senatorial slots and 4,680 for the 360 House of Representatives elections seats. Many governors rounding off their second term in office had made the list for senatorial contest while some serving senators could not secure the tickets of their parties. 28 women made the list as presidential candidates or running mates. President Muhammadu Buhari of the APC appear to be the oldest contender while 30-year-old Johnson Omede is the youngest as vice-presidential candidate of the New Nigeria People's Party (NNPP). INEC will on Jan. 31 release final list of governorship and House of Assembly candidates.